Unable to view this newsletter? Every year about this time we start hearing a buzzing or singing noise coming from trees and we start seeing beetles large enough to put a saddle on. Both of these insects show up around July and after 3-4 weeks are never to be seen again until next summer. Both the Cicada and Palo Verde Beetle are relatively harmless but create a great deal of interest and concern with most people. Let's take a look at both insects and hopefully your interest will be peaked and any concerns will be put to rest. 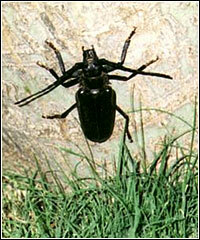 The Palo Verde root borer in the larval stage is grub like and up to five inches long. The adult beetle, a borer or long-horned beetle, is three to three and a half inches long with long antennae, short stout mandibles and a sharp spiny pronotum (the plate behind the head). The adult beetles are active in the summertime, flying mainly in the early evening hours, becoming a hazard to navigation for motorcyclists. The larvae consume the roots of trees, boring into the starchy middle area although sometimes cutting across and removing the entire root. The larvae hatch from eggs deposited in the soil under the tree by female beetles. Infested trees seem to have three sizes of larvae present most of the time, so a three-year life cycle is assumed. The palo verde part of the common name is a little unfortunate, because the larvae affect a variety of non-native trees at lower elevations. The name came from the almost universal presence of larvae on the roots of dead Mexican palo verde trees in Tucson. Look for branch dieback and for quarter size "exit" holes in the soil around the root zone. Currently there is little that can be done to control these beetles. They attack stressed trees, so the best prevention is to keep trees as healthy as possible. Turn off outside lights to avoid attracting the adults. Placing pesticides in the exit holes does little good as the beetle is already gone. A better strategy is to focus on improving the health of the tree to help it outgrow the damage by providing adequate water and fertilizer. These insects are commonly heard in the summer buzzing or singing in trees. Cicadas are 1-1/2 to 2 inches long with thick bodies and bulging eyes. The most common species in lower elevations of Arizona is the Apache cicada, which is dark-colored with a pale tan band just behind the head. The adult males produce the loud, shrill noise to attract females. The male Cicada may be the loudest insect known to man, their shrill can be heard as far away as 400 yards. Cicadas are not harmful to humans in any way. They do not bite or carry diseases. The cicadas spend most of their lives as immature's, feeding underground on the roots of trees or other perennials. The immature's move out of the soil during summer evenings, starting in June about Father's Day. They leave behind holes about one half inch in diameter. They crawl up nearby tree trunks, plants or buildings and cling there. If you watch, eventually the back of the nymph begins to split open and the adult winged cicada emerges. Homeowners often find the leftover skins attached to foundations or trees. Cicada adults live three to four weeks. After mating, the female cuts open twigs with her saw-like egg-laying apparatus, and deposits her eggs in the slits. When the eggs hatch, the nymphs drop to the ground and burrow into the soil in search of food. The species of cicada found in Arizona finish their life cycles in two or three years. There is one species found east of the Mississippi, however, called the 17-year cicada. The immature's of this species stay underground, feeding away on tree roots, for 17 years! Then, using some clue that is not yet well understood, all the adults come out at the same time to mate and lay eggs for the next generation. Available evidence suggests that the immature's do little or no damage to plants by feeding on the roots. The adults have sucking mouthparts, and do some feeding on twigs, but they don't damage the plant. The saw-like cuts caused by egg-laying females may injure twigs, and a heavy infestation of cicadas can injure young, newly-planted trees. If you have had problems in the past with high numbers of cicadas, you may want to protect young trees by covering them with a netting or open weave cloth when males are singing. Also, you should wait to plant new trees until the fall if possible. Insecticides are not recommended for cicada control except in commercial plantings. Cicadas are active and fly long distances, so spraying of one or a few trees is just not worthwhile. Cicadas do have many natural enemies and diseases, however, which keep them under control. They are susceptible to a fungal disease that attacks the nymphs. Birds, predatory insects, and mites all feed on cicadas. Arizona Exterminating Company is one of Arizona's oldest and most reputable pest control companies. Began in 1936 as a family business, AEC now has six offices across Arizona. We currently have over 100 employees, all of which are certified by the State of Arizona and trained in the latest and most-up-to-date pest and termite control technologies. AEC holds an 'A' license through the Structural Pest Control Commission of Arizona and currently has over 30,000 clients throughout Arizona. Whatever your pest and service needs are we have the safest and most effective treatment for you. And because we are 'Arizona grown and raised', we are experts in treating and controlling Arizona pests, giving us an edge over the 'generically trained' national companies. Arizona Exterminating was voted the #1 Pest Control Company by Ranking Arizona The Best of Arizona Business for the sixth year in a row. We also made #51 in Pest Control Technology's top 100 companies in the Country. So whatever your pest needs are you can be assured that Arizona Exterminating Company will provide you the Quality Pro service that you expect and deserve.